Subscribe to our FREE monthly newsletter for information on specials and exciting new products. Sign up now and receive our "Care of Your Flags" e-book free. We do not share your details with anyone. You can unsubscribe at anytime. Bunting PennantThis bunting from The Aussie Flag Factory features coloured plastic vinyl flags sewn together on a header tape. Bunting is perfect for drawing attention to your sales, promotions or sporting events. Choose your colours; either plain or a combination, and choose your length. Flags are 220mm deep x 85mm wide and sewn up in banks of 1m per colour. In Bali, people use Umbul Umbul flags to proclaim the presence of the gods and signify consciousness at the highest levels. On an island known for its artistry and love of beauty, these flags are used for rituals and festivals throughout the year. For the rest of the world, these stunning flags can be used in a multitude of ways limited only by your imagination. These 5 metre or 7metre long majestic Bali Flags and poles will look stunning and unique in any setting. They can be used as decorative displays for parties, functions, fairs, markets etc. They are also perfect for business advertising purposes, such as real estate auctions, nurseries, car yards and much more. Traditionally seen in Balinese temples as well as gardens along the tropical beaches of Bali, these flags are becoming increasingly popular as colourful and spiritual additions to weddings all around the world. 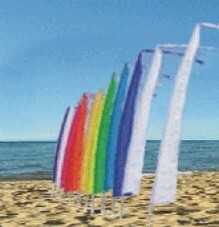 These flags are manufactured in Bali out of parachute silk, a very strong durable and light weight fabric. These flags are hand made they do vary slightly, they average a bottom width of approx 510mms. The pole is a specially designed, collapsible fibreglass pole, extending from 1m up to 6m. They are lightweight, very easy to erect and have a rubber tip on the end, so that unlike traditional bamboo, they won't poke a hole through the end of your lovely flags. These flags from The Aussie Flag Factory are manufactured in Bali out of parachute silk, a very strong durable and light weight fabric. The complete length of the flag is 5 metres; when poled they are 4 metres with a one metre tail. These flags are hand made they do vary slightly, they average a bottom width of approx 510mms. Flag only, poles sold separately. Or alternatively use traditional bamboo or even conduit pipe from your local hardware. These flags from The Aussie Flag Factory are manufactured in Bali out of parachute silk, a very strong durable and light weight fabric. The complete length of the flag is 7 metres; when poled they are 6 metres with a one metre tail. These flags are hand made they do vary slightly, they average a bottom width of approx 510mms. Traditional Product Generate a peaceful energy. Bali Flags (Umbul Umbuls) from The Aussie Flag Factory in Silk - 5m red with SALE screenprinted in white. Great for all those sales and promotions. 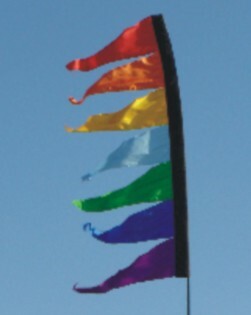 These fantastic colourful pennant flags are 2 metres long and really flutter in the slightest breeze. They are extremely bright, festive and eye catching! Flag only, suitable for use with our telescopic fibreglass poles. Tibetan Prayer flags are believed to bring happiness, peace, prosperity, good fortune, health and victory over obstacles. Prayer flags are used to promote, peace, compassion, strength and wisdom. Horizontal traditional Tibetan Prayer Flags, hand crafted. Extends to approximately 2.2 metres, individual flags measure approximately 160x175mm. 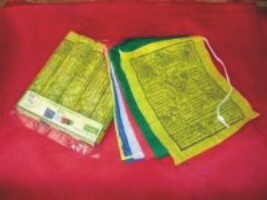 Horizontal traditional Tibetan Prayer Flags, hand crafted. Extends to approximately 2.5 metres, individual flags measure approximately 220x170mm. These telescopic fibreglass flag poles from The Aussie Flag Factory are lightweight and extremely durable. They extend in one metre lenghts to a total of 6 metres and collapse down to just over 1 metre for convenient transport and storage. Unlike the traditional bamboo, the rubber ball at the end of the pole will resist wearing a hole through your flag. These flags from The Aussie Flag Factory are manufactured in Bali out of parachute silk, a very strong durable and light weight fabric. The complete length of the flag is 2 metres. These flags are hand made they do vary slightly. These flags come with their own bamboo poles. These come in a set of 2 flags and poles. These Bali flags from The Aussie Flag Factory are perfect for that Beach or Garden wedding. 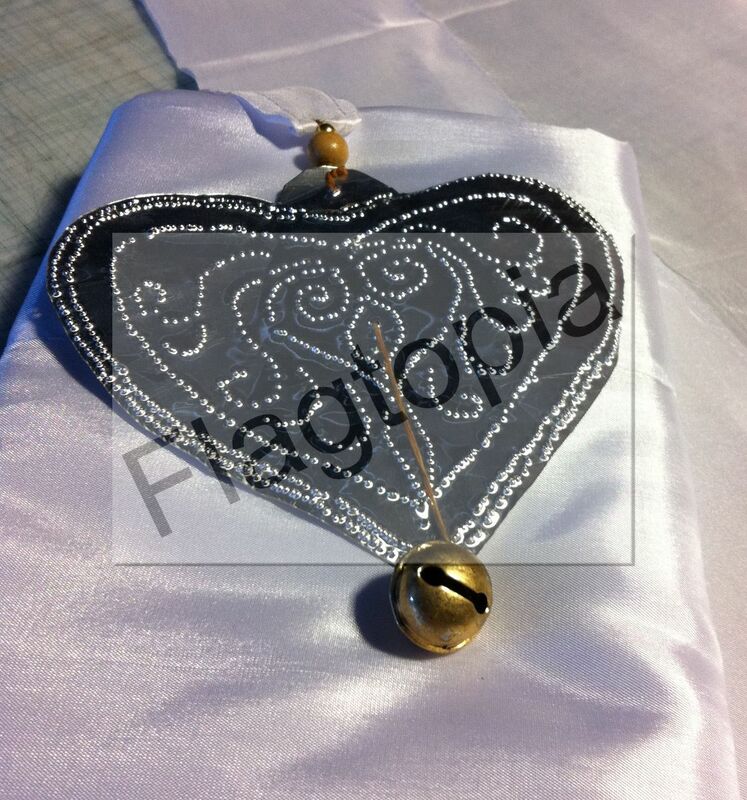 They are white silk with a handmade silver metal heart and bell, simply gorgeous Wedding flags. They are a beautiful momento of your big day. Why not ask about having them personalised as well. 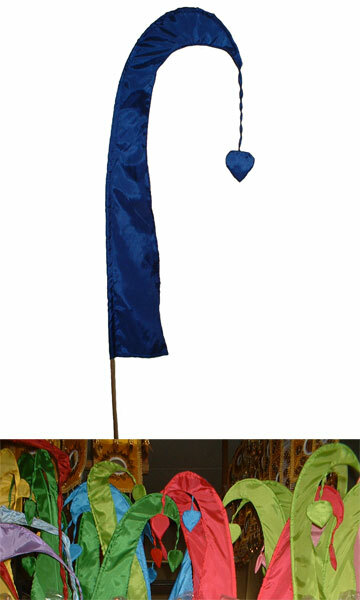 These flags are manufactured in Bali out of parachute silk, a very strong durable and light weight fabric. The complete length of the flag is 5 metres; when poled they are 4 metres with a one metre tail. These flags are hand made they do vary slightly, they average a bottom width of approx 510mms. Please contact us for further information. We will get back to you as soon as possible. Thank you. We provide swooper flags, bali flags, banners and custom printed flags to the individual, schools, offices, medical centers, car dealers, hotels, caravan parks, councils, parks, Government, shows & fairs, markets. We sell Australian flags, swooper flags, end sign flag, super seller flags, bali flags, banners, pennants and bunting, custom printed flags, automotive flags, real estate flags, message flags, advertising flags, hand waiver flags, car flags, bow flags, feather flags, teardrop flags, national flags, world flags, indoor flags, corporate flags, wind socks, wind dancers, air dancers, flag poles and accessories. With offices in Queensland and our factory in Northern New South Wales, we sell flags Brisbane, flags Sydney, flags Melbourne, flags Darwin and flags Perth. We sell our flags into all states and overseas.